It was only after some hesitation that pretty Carol Lee took the assignment with old William Elliott. 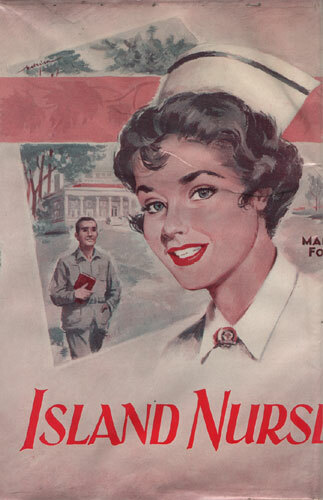 the case that had brought her to Bayport, that of the aged Elizabeth Stafford, who had broken her hip, had been a short-term one, and now Carol wondered about the advisability of secluding herself — possibly for a long time — with Mrs. Stafford’s friends, the Elliott family, on their exclusive island home, Myrtle Island, across the bay from the mainland. But Carol was charmed by the Elliotts’ great white-columned mansion, and when she met the prospective patient, the harsh but human cardiac case Mr. Elliott, she knew that in caring for him she would gain valuable experience both in medical practice and in bedside manner. And the other members of the Elliott clan, as well as many of the other local island residents, most of them with the money to go with it, were most cordial, welcoming her with enthusiasm into their social lives. And within days after her decision, Carol is glad she has taken the case, for she finds herself excitingly involved in the romantic life of the young people of the islands. Breathlessly, she discovers that Ronnie Beaufort has swept her off her feet. And between dates, when she is again down to earth, David Elliott is there, taking up more of her time. Two attractive and eligible young men, as completely different as possible: Ronnie, a reckless, extravagant, fun-loving yachtsman; and David, the thoughtful and scholarly owner of the bookstore in Bayport. Of the two, David provides the more intellectually satisfying company, but Carol cannot help being fascinated by the exciting, zany Ronnie. Before many days she decides she is in love with him. But a chance discovery by Carol and David, of a new still mysteriously set up on an abandoned estate on one of the local islands, greatly disturbs the tranquility of life in the Carolina lowlands. And not long after, a violent hurricane sweeps across the South, a storm that separates the frantic Carol from her patient, marooning her on another island, one in grave peril from the raging, rising sea. The climactic events that rapidly ensue bring Carol startling information about the Beauforts and the Elliotts…and, finally, about the true object of her love.